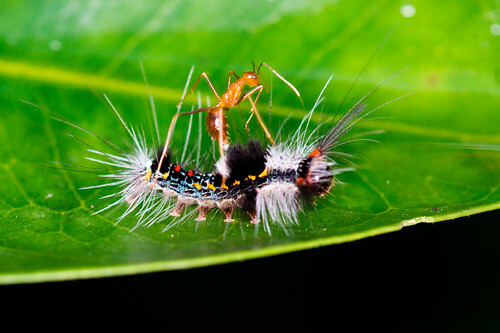 Nature Magnified: Ant Riding a Caterpillar! If you ask me to explain these photos I`d be at a loss! I was busy shooting this caterpillar for my previous post (10 caterpillar macro images to make you squirm! 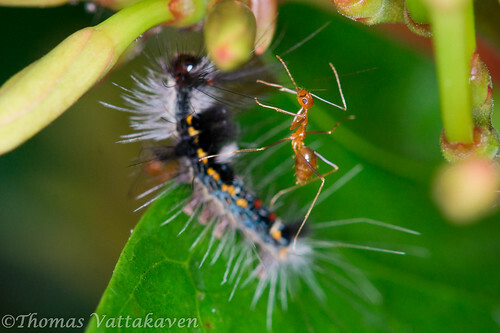 ), when out of the blue, an ant popped up on scene and mounted the caterpillar. The caterpillar grew distinctly uncomfortable and started to move around the leaf, carrying the ant upon its back and offering me a chance to snap this fortuitous scene. The ant did not remain still and was off the caterpillar’s back in seconds, but it did get back on a couple of times as it scurried speedily all over the leaf. Perhaps this is some sort of intentional interaction between the two creatures. 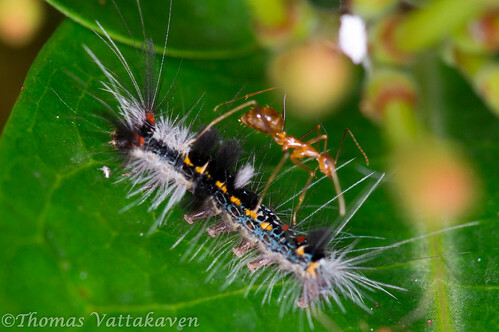 Maybe the ant was chasing it away, or perhaps even shepherding the caterpillar. Any clues?